At the moment, the project is still a concept waiting for a customer to sign. However, "Marco Polo" creatively designed by Camillo Costantini for Fincantieri represents the top result from the current high technology. At first sight the design, a mix of styles, of old and new forms revealing tradition, catch immediately our eye. 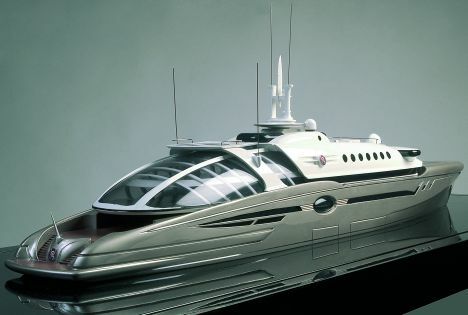 Looking at the profile, some key - elements resulting from modern design concepts are actually noticeable in the aft glass dome, in the shape of bottom and superstructure lines and in the bridge looking like that of new passenger ships, as well. In opposition to, the bow shape recalls classic '30 yachts, while the circular windows are inspired by old ships. Given the size of the yacht, 102 metres in length, "Marco Polo" with her immense interior can be rightly defined as a cruiseliner made for private use. Six decks, one of which is quite fully dedicated to the owner, reveal the greatly comfortable liveability on board. Guests have huge areas either on the lower or on the upper decks while the crew quarter runs along the lower one lying below the waterline; this features also a great deal of services made for suiting all needs of 81 people, including crew members, who can be accommodated on board. The forward quarter is partly dedicated to the crew and offers 15 cabins each with private bathroom. Right aft two hangars store some tenders: five jet-skis, two huge rubber dinghies and a medium - sized craft, perhaps a classic runabout. Going aft a swimming area develops featuring a circular - saloon, a beach club and a further terrace on the opposite side, while the bow area includes the second crew quarter plus six cabins each with private bathroom; the rest of it offers six guest double suites, two in - line bed staterooms, eight bathrooms with hydro - massage tub, a dining area, a relax zone and a giant saloon covered by the glass dome mentioned above. On the upper deck, dedicated to guests as well as the lower one, there are four Vip cabins each with king - size bed and a forward "Royal Suite", all with private bathrooms. Located on the same deck are two relax areas, one of which is equipped with an entertaining centre, and an aft huge saloon with a gaming table and a grand piano, overlooking the sea thanks to the glass dome. Around the suites wraps a long corridor in the open air running up to the bow that conceals two garages, each hoisting a tender and a crane. 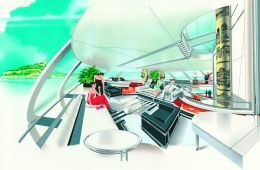 The fifth deck features the immense owner's area including a full - beamed suite, two great, separate bathrooms, a saloon, a relax area inside the dome with a shell - shaped swimming pole. On the same deck are also the pilot bridge, structurally similar to that of a merchant ship, and the captain's cabin. Placed on the sixth deck, wholly dedicated to fitness activities, are a fitness room and an external area with sunpads, Jacuzzi and wet bar. Of course, yachts of this size cannot lack a helicopter pad designed aft on this deck.